Leadership Programme at Said Business School a dream came true. Since I was a child it was my dream to study at Ivy League level. And of course Oxford is the pinnacle. World’ s most prestigious university with alumni as prominent as Albert Einstein, Oscar Wilde, J.R. Tolkien, more than 40 prime ministers and more than a dozen nobel laureates. And the OAMLP is not any executive program. It’s the school’s flagship programme. It’s the program CEO’s, high government officials and other top-executives attend to learn from the best. The faculty is creme de la creme and the learning environment in Egrove Park is exceptional. As Said before: A dream came true! Friday, 21st of October this year a surprise came true. An honor bigger than I would have even tho ught dreaming about it. I have been awarded „Outstanding Alumnus“. 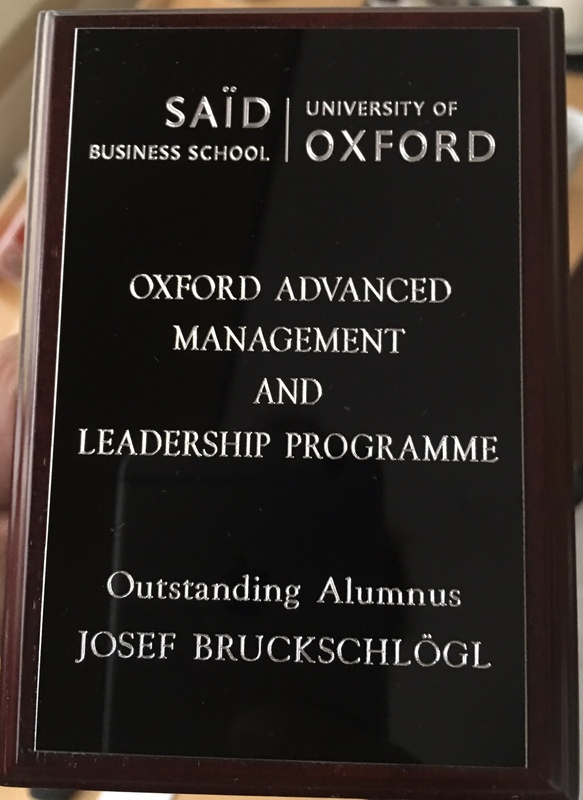 I am the third person who is honored with the award and in his laudatio Prof. Lalit Johri, my admired mentor and Program Director of OAMLP highlighted my economic, academic and social contributions. He mentioned my achievements at KWAK Telecom Ltd., the extensive work we did on recorded interviews reviewing the learning process of OAMLP during the last two years, our work on the development of OCSIF and the development of my paper „The 6th force of Strategy“ based on OAMLP learnings. I guess it was one of my proudest moments so far! Previous Is social Media the prime catalyst of Terrorism and Violence? I think yes!